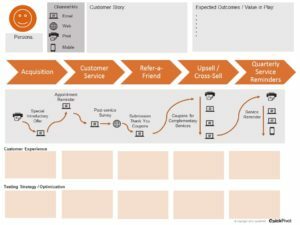 Think of journey mapping as the storyboard for your customer’s experience. It’s where you outline a picture and short narrative of exactly how you want the experience to unfold. The design should be simple enough that anyone in your organization could scan it quickly, see what you are trying to accomplish, and participate in a strategic discussion on your approach. The goal of journey mapping is to maximize the creation of customer value, and minimize any gaps that could sabotage that value. A couple of concrete examples to build on might help. In the cable communications industry, for example, it's no secret that a tremendous amount of value is in play during the new customer enrollment process. Great care is taken to maximize the customer’s installation experience, services bundle, and trial period options. The goal is a flawless installation, multiple package upgrades, and a customer that will renew their service for years to come. Missteps during the installation process, or clumsy package upsell mistakes, like promoting the same channels twice, and a myriad of other blunders put value at risk. In the retail automotive services industry, customer long term value is created when a first time customer becomes a repeat customer. A single oil change leads to a second oil change three thousand miles later. Two well executed oil changes may earn the brand the chance to service another family vehicle. The goal is flawless execution, the establishment of trust, and a customer that will rely on one provider for multi-year, multi-vehicle maintenance. Missteps during appointment scheduling, or vehicle maintenance data errors, like recommending an oil change at the wrong service interval, and a host of other blunders could make a driver second-guess their decision to come back. Each industry has its own unique nuances that frame the customer journey, but each industry shares the same opportunity and risk. It is the Value-in-Play (ViP) that needs to be managed, and customer journey mapping is the critical skill and marketing technique to help get you there. As we enter the final quarter of this year (and the holiday season), now is the time to assess your journey maps and make a push to increase revenue and finish the year strong. Time to hit the drawing board. 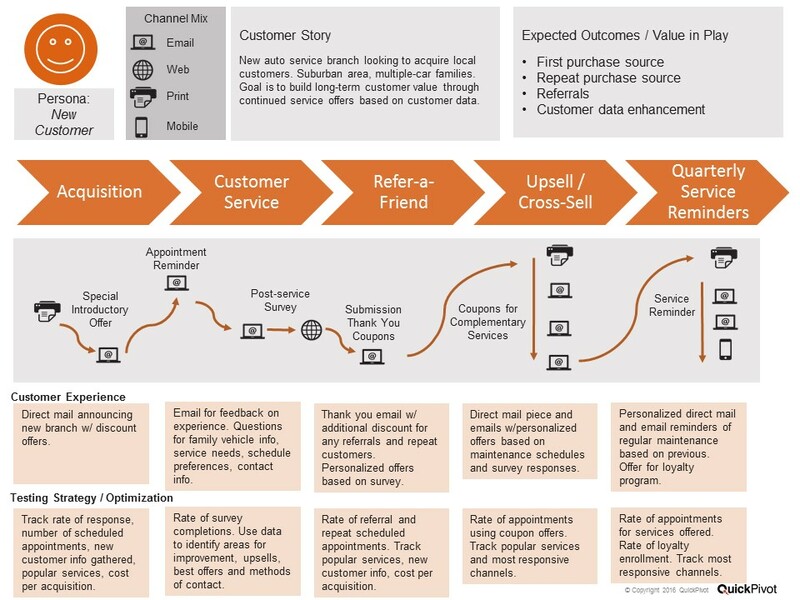 Here are the some key points to remember when assessing your customer journey maps. Are you sure that you have a journey map for ALL of the most critical points in your customer’s lifecycle? Now is the time to double check. Value-in-Play (ViP) moments are those critical parts of the customer lifecycle where the customer’s journey needs to be tightly mapped. Many brands don’t cast a wide enough net, don’t build a complete inventory of maps, and miss ViP moments as a result. They manage obvious ViP moments, but oftentimes leave other, equally valuable moments unmapped. Step one in helping you make your year in 2016 is a simple ViP inventory. Do you have complete coverage? Do you see ViP moments that are unmapped? If no, then great. If yes, then read on as we provide tools and templates to help you quickly cover those gaps. It’s not too late to get a conversation started, and cover any gaps ahead of Q4. The foundation of any journey map is a persona. Not just one person, but a group of customers with shared characteristics who might respond in a predictable way that can be tested and measured. To build on the automotive services example above, there might be different personas for Busy Moms, Seniors, and First Time Car Owners. While the overall journey map might look very similar, include the same number of touches, and follow a similar timeline, the strategy and content for each persona might differ greatly. For example, Busy Moms may favor convenience and easy scheduling options, so email touches with direct links to scheduling tools and blocks of time during school hours are an important part of the strategy. First Time Car Owners may find value in the offer of a free car wash with each oil change, and deeper levels of car-care content that can be linked via email or easily referenced on a mobile device. These personas might all have a journey map called Initial Oil Change, but the strategy, content, and timing of messages might vary. Journey maps help you keep nuanced stories that fall under the same ViP moments clear. It's common for brands to have a book of journey maps by persona, and revisit them often as more and more campaign activity data is collected. Whether you're starting from scratch, or just re-assessing your journey maps, our research should start with your own data. That includes site analytics like source, visit duration, and user flows (see the image to the right). This should give you an idea of how people are discovering you, and what they are looking for when they find you. Also look at your campaign activity history data broken out by persona. How individuals have responded in the past is a great predictor of how they might respond in the future. A user flow will also help you identify journey gaps. Along the journey map you may find gaps that cause visitors to veer off of the desired path, or drop off the map entirely. Follow in the footsteps of your customer to see what they are seeing throughout the journey you've created. You may notice that part of the path doesn't align with the desired goal, or that the content you're delivering doesn't align with the customer's expectations. What results is a quick disappearing act from your journey map. Customers might exit from your site, abandon a purchase, or simply won’t provide any type of response (explicit or implicit) at all. These are the areas that you are trying to improve, and now you can see them on a map. The cause of these gaps could be either poor design at that point in the journey, a lack of proper data, or simply a bad content experience. Journey mapping makes it easy to highlight these challenges, which can bring focus to your forensics, and spark the right conversation to get you back on track. If you discover points where customers are diverting from the desired goal or abandoning the journey altogether, make the necessary changes at those pain points to steer them in the right direction. This is where the journey map becomes a tool you can use to increase revenue. Again, it's your drawing board and it's editable. If the flaw is in the design, you could consider adding or altering touchpoints, or updating the content that is being offered at a given point in the journey. If the flaw is a result of bad data, then you may need to update your database to capture the appropriate information that will help you better assess what your customers want to see. You’ll know that your design is at the wrong level if the conversation goes into the weeds immediately, and you find yourself explaining details of each decision in the journey vs. the overall strategy. To help you find the right design at the right level, we've provided this editable Powerpoint slide. Download it by clicking on the image below. Here is a filled in example as well. Well-designed journey maps drive a business outcome through better management of the customer experience at critical points of interaction with brand, called Value-in-Play moments. Analyzing ViP moments of a customer journey can help you better understand why customers take certain actions. Digging into your own data and developing a journey map will show you how customers are moving through the funnel. Once you understand how people are interacting with your brand, you can orchestrate a better experience and drive them towards more value.